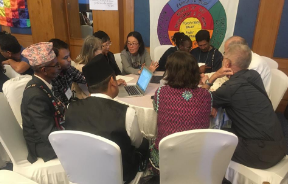 World Gathering Appreciation: Looking toward 2018 – Alternatives to Violence Project International, Inc. The donations which allowed AVPers from 40 countries to gather and work together, including a $2 contribution from a local volunteer (two hours of their pay as a semi-professional). Distribution of print and electronic manuals at the 2018 Africa Regional Gathering. Can you match our gathering volunteer with a donation of two hours wages? Please give to AVP International as generously as you can at: https://avp.international/donations/ or by mail to AVP International/ PO Box 164/ Purchase, NY 10577/ USA. Thank you for also supporting your local AVP group.